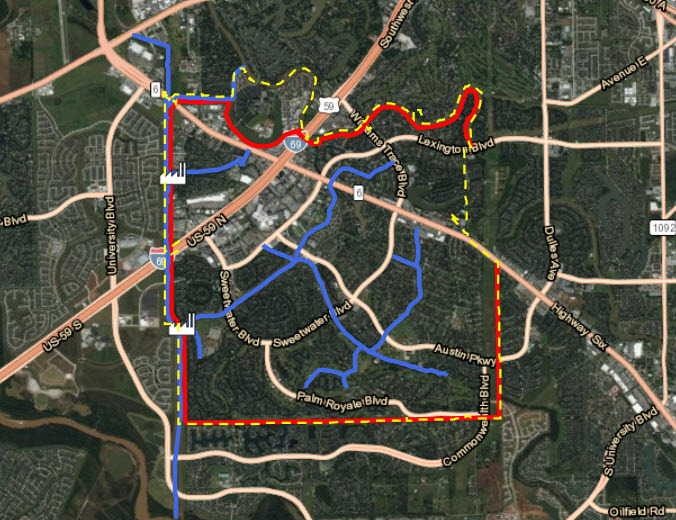 Sugar Land flood zones–Sugar Land is located near the Brazos river and has an elevation of 100ft, therefore, flooding is a potential hazard that needs to be understood. There are also many neighborhood lakes (and Oyster Creek) that run through Sugar Land and could serve as potential flood hazards. However, most of the Sugar Land neighborhoods, that could have potential flooding issues, are currently protected with a vast levee system. Whenever you buy a home in Sugar Land you should obtain a recent survey and flood certificate to notify you if the home is in a Sugar Land high-risk flood zone or not. Most homes in Sugar Land do NOT require flood insurance because the flood hazard is considered very small. But if you have concerns, there is national flood insurance available at an extremely low cost ($400/yr) to most home owners. 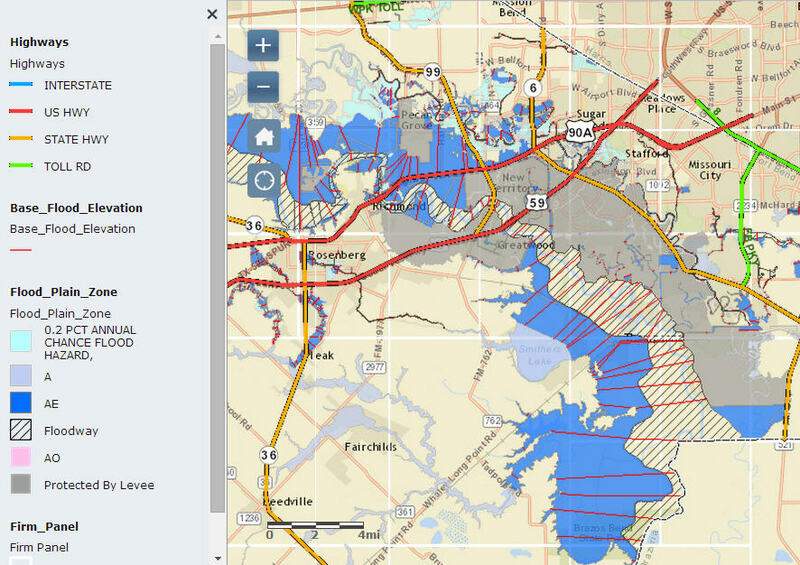 As a service to all of my buying clients, I always research the FEMA flood maps to ensure that you know which Sugar Land flood zone (if any) a home is located in BEFORE you purchase. View a sample of my House Report. There was a major rain event In Sugar Land on Memorial Day 2015 that produced 10 inches of rain in 8 hours. I contacted friends/clients throughout the area to see if anyone experience flooding in their home…none did. 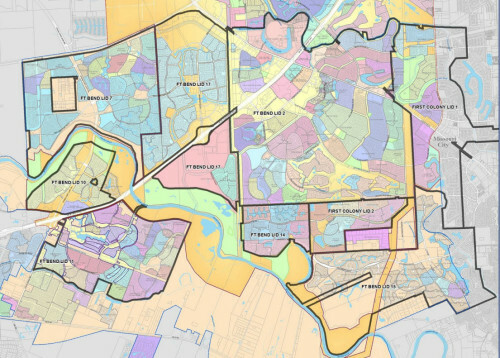 The City of Sugar Land has posted a forum with reports from people throughout the city to see what different areas experienced (read details). It appears that drainage ditches, bayous, and lakes got full and the streets flooded but I didn’t find any reports where houses were flooded. Our streets are designed to be lower than the homes and they direct rainfall to the storm drains. If you leave a car parked on a street during a flash flood, it may get flooded, but I have yet heard of areas in Sugar Land where major house flooding has occurred. The levee system here works very well! What Sugar Land Areas Flooded After Hurricane Harvey? While flood zones are typically rated as 100-year or 500-year, Hurricane Harvey is being described as a an unprecedented, 1,000 year event (read more)! This means that homes that flooded during that once-in-a-life time weather event may never flood again. So let’s keep our wits about us. Investors (who are keeping their wits about them) are flocking to the area to buy homes that others won’t consider…because they know that a home that flooded during Harvey is not an indication of future flooding. In fact, less than 1 percent of Sugar Land homes were flooded during Hurricane Harvey…so don’t let what you see on t.v. 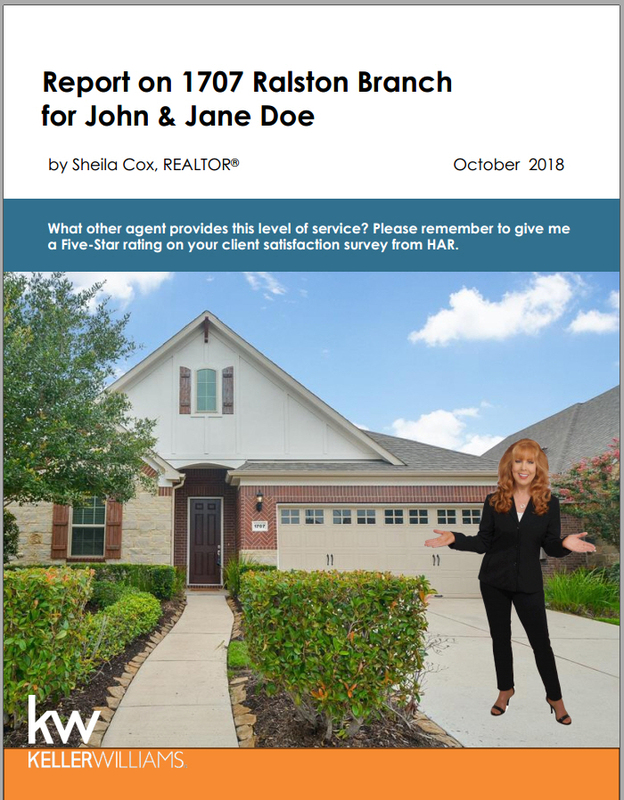 give you the wrong impression…most of the homes in Sugar Land TX do not flood on a regular basis and did not flood even during this HISTORIC hurricane. 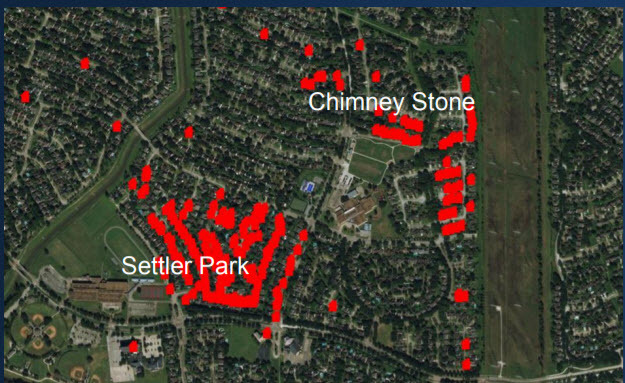 In Sugar Land there were approximately 230 homes in Fort Bend County LID #2 (map shown below) that flooded and 17 homes outside of LIDs. Knowing that LID #2 covers approximately 9,000 homes in First Colony, that means that only 2.5% of homes there flooded during this once-in-a-lifetime, historical rain event. Hurricane Harvey affected a few homes the Riverstone Development. 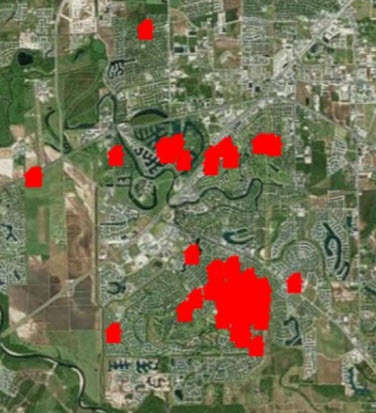 All the homes that are affected are in Levee Improvement District 19. The subdivision of Millwood at Riverstone had widespread flooding during Harvey and the residents have filed a lawsuit. So did the street of Falling Briar Lane in Riverstone. 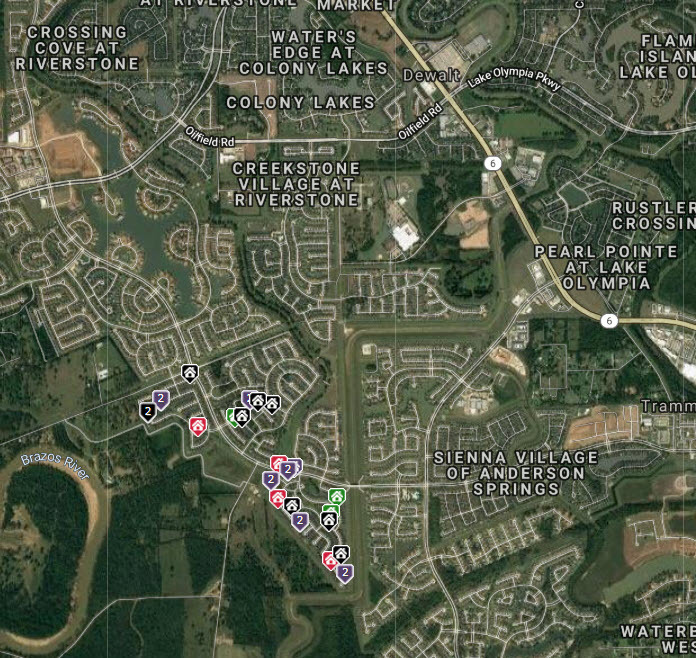 Other subdivisions in Riverstone that had a few flooded homes (but not widespread flooding!) include: Sweetbriar, The Orchard, Lost Creek and Shadow Glen…all of which are close to the Brazos river (see map below). According to reports, only about 65 of Sienna Plantation’s 7,700 houses flooded…less than 1 percent. It is difficult to determine exactly where the flooding occurred but it seems to be on the West side, closest to the Brazos River in Sienna Village of Waters Lake, and on the Southeast side in Sienna Point (new section). 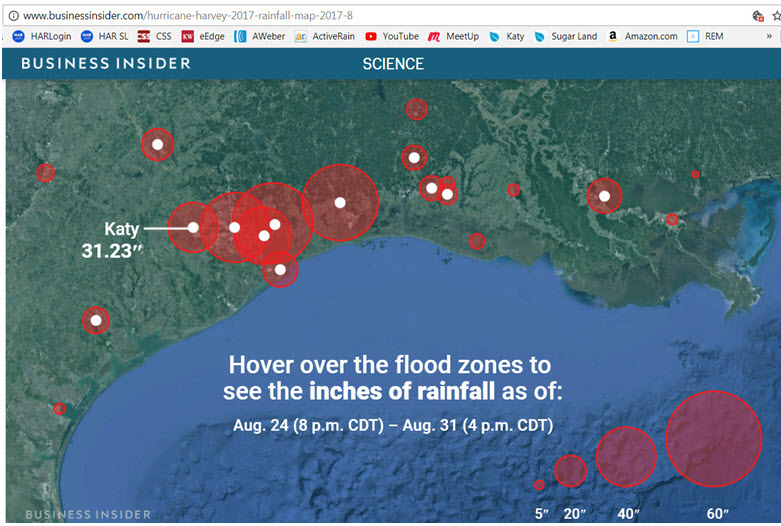 >> See Hurricane Harvey event analysis in Sienna Plantation and Hurricane Harvey Event Analysis p. 10. Again…not all the homes in these neighborhoods flooded! The water got high and some of the roads were flooded for a few days, but this was an unprecedented weather event which is very unlikely to ever occur again. With that in mind, I will say that it will be very important for home buyers to watch out for repaired homes and to make sure they have been repaired properly. And I will also say that there are areas in Houston that are prone to flooding, year after year, and you need to have a local Realtor who knows how to check the flood maps and filter out those areas from your search…like me! And finally, as a resident of the Gulf Coast, you should know that hundreds of homes in the Houston area that are not in high-risk flood zones and had never flooded before during any other flood or hurricane event, did flood during Harvey. So that means…you never know for sure and you had better carry Flood Insurance on your home at all times! In my opinion, a $400/yr flood insurance policy is worth the peace of mind you have from knowing you won’t be financially devastated if a storm sits on top of your neighborhood and drops 50 inches of rain! I don’t know of any areas in the country that can handle that much water…do you?